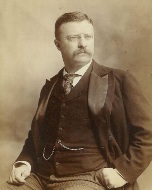 Well written and admiring biography of Theodore Roosevelt written shortly after his death. Hagedorn received the blessing and full cooperation of Roosevelt's family and friends and the result is a richly fascinating portrait filled with charming anecdotes rarely found in presidential biographies.
" Character, in the long run, is the decisive factor in the life of an individual and of nations alike. "